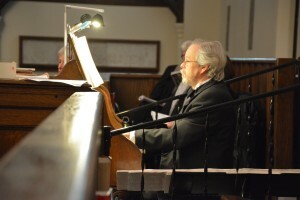 Dan Moore has been the accompanist for ChoralArt since 2001. Dan plays full-time at the Mount Washington Hotel. He also does a wide variety of freelance work in many different musical styles. When not earning a living playing the piano, Dan likes to bust his knuckles disassembling old rust bucket vehicles in order to let out the evil spirits. He has studied music with Russell Hayton, Phillip Steinhouse, Geno Haggerty, and Clarence Snyder, among others. Dan currently lives in North Bridgton with his wife Nan Beury, along with four cats, more chickens, and even more bees.